Is Russia influencing the U.S. presidential polls? 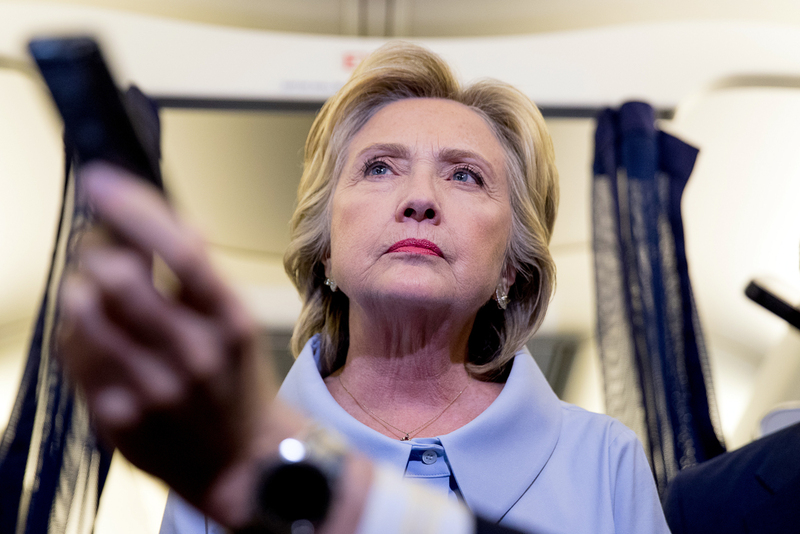 Democratic presidential candidate Hillary Clinton takes a question from a member of the media on her campaign plane while traveling to Quad Cities International Airport in Moline, Ill., Monday, Sept. 5, 2016. Hillary Clinton, the U.S. Democratic Party presidential candidate, says Russia can influence the process of the U.S. presidential elections in November. Russian experts believe her fears may be real. As recently as September 5, Hillary Clinton said there are "credible reports of Russian interference in our elections." The presidential candidate was referring to a scandal involving the hacking of the Democratic National Committee's computer servers. No official statement directly accusing Moscow for the hacking has been made, but U.S. officials have said the investigation of the matter is continuing. Russian President Vladimir Putin has denied the accusations of hacking, saying that Moscow was not engaged in such things "at the state level." This is the first time Russian agencies have been accused of a possible attempt to influence the outcome of U.S. elections. This is largely due to the maverick figure of Republican Donald Trump, who is considered a "pro-Russian candidate" because of his reverence for Putin. The American billionaire's links with Russian agencies are under close scrutiny, The Washington Post reported a U.S. intelligence official as saying on condition of anonymity. "In the U.S., they say that Russia is in decline, but when it comes to everything that is associated with cyber threats, it appears that the country is very competitive and with greater ability than China," Atlantic Council analyst Matthew Burrows said in an interview with Gazeta.ru. "Russia conducts these operations at a higher level." Some analysts believe that, in the event of a massive hacker attack, voter rolls could be under threat. In August, the FBI reported that hackers accessed an Illinois Board of Elections' database, stealing 200,000 personal voter records. The FBI said Russian security services are suspected of involvement. Senator Harry Reid asked the FBI in July to investigate Russia's ability to influence the November vote. He noted that his talks with intelligence officials have left him fearful that Putin’s goal is "tampering with this election." Can Russia interfere in U.S. elections? Such fears do exist in the United States, says Nikolai Zlobin, president of the Centre on Global Interests in Washington. Hackers, for example, may be able to interfere with U.S. voters who vote on the internet. So far, however, online voting is not very common, and the majority of Americans prefer to vote with paper ballots. Much more dangerous is the possibility of vote manipulation in key states, Zlobin believes. "It is not possible to do it everywhere, but if you create a slight advantage in a particular state, it is possible to radically change the results," he says. The political analyst cites the 2000 presidential election between George W. Bush and Al Gore. According to the initial vote count, it was won by Bush. Because of 43,000 disputed ballots, the Florida Supreme Court ordered a manual recount. However, the recount was stopped by the U.S. Supreme Court and Bush was declared winner. Some Kremlin watchers in Washington, who believe that Russian authorities interfered in the American electoral process, think Moscow is playing on Trump's side. Putin did voice support for the Republican candidate, but later said that the country's leadership is ready to work with any American administration. Russian state TV channels do show Trump more often than Clinton. But that is likely to only indirectly influence the sympathies of Russian-speaking U.S. citizens, who would have a relatively small impact on the election results. Currently, Clinton is ahead in most polls, but much still depends on television debates between the two candidates, to be held in late September. Does Moscow really care who prevails in US elections?